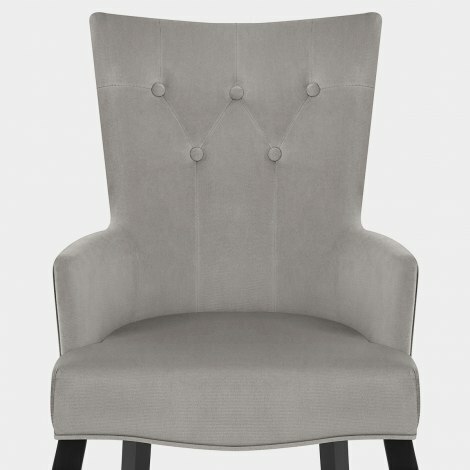 Effortlessly elegant, the Fleur Chair Grey Velvet is a luxurious design and will grace your interior with a sense of splendour. Placed around the dining table, or in the bedroom, the Fleur is a majestic model with endless possibilities and excellent comfort. 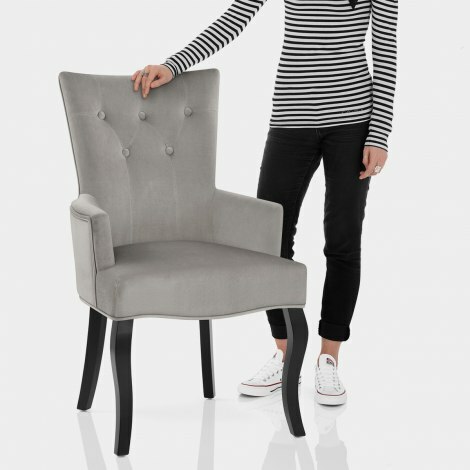 Offering outstanding comfort, the sprung and belted seat is swathed in divine grey velvet. Cutting a striking silhouette, the elongated backrest is framed by two squared armrests, each padded for extra comfort. Plus, button detailing adds a decorative touch and gives regal charm to the design. Adding a traditional aesthetic, the front two wooden legs have a cabriole design, whilst the whole frame is given a modern twist with a black satin finish. As an additional feature, protective floor plugs are also included. "Gorgeous chairs, will be ordering more"
Gorgeous chairs, will be ordering more. Quick delivery and was kept up to date right till arrival. Very comfy chair will order more.